The whole talk was focused on how to succeed in doing systematical good design. Karri said: “We don’t need to be lucky or divinely inspired; we just need to do the right things”. It’s not exactly the right thinking, in my opinion, but it is a good start for a discussion. 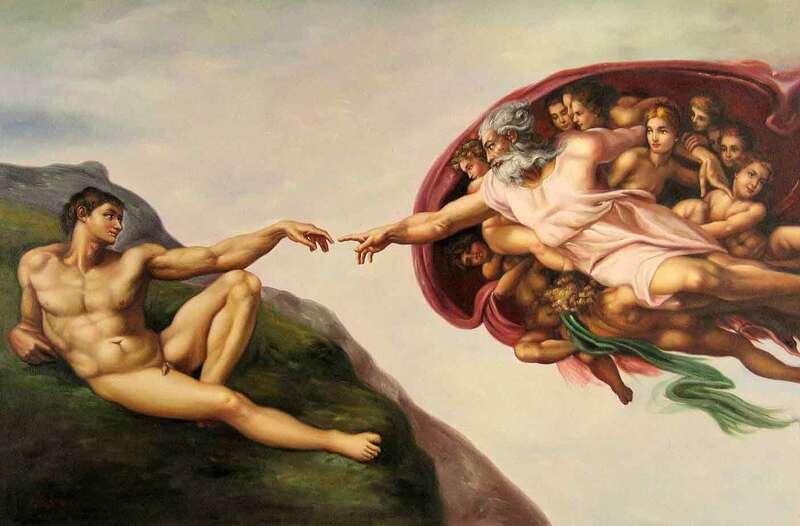 After intro to subject, Karri showed a picture “God creates Adam”, where the hand of the God touching the human hand (see Figure 1). That was related to the human divine. With this picture he wanted to express that people believe that creative work must be inspired and people tend to do crazy things to get the inspiration. Figure 1: God creates Adam (Michelangelo, Sistine Chapel). Very quickly he showed another picture: “Newton’s iteration” representing the idea that through realistic points that people set it is possible to come up with a reasonable result (see Figure 2). Even though we do not get inspired, it is possible to follow methodologies, process, patterns, etc. Figure 2: Newton’s iteration function. Next topic he materialized by showing the picture of Porsche 911 engine (see Figure 3), where technology meets beauty to make it functional and powerful. He pointed out that this kind of engine is an extraordinary thing; very complex and extremely individual. By this comparison he wanted to highlight the complexity of design project and their individual character. In second part of his talk, Karri highlighted the team importance saying, it is amazing thing that people from different background and cultures can contributes to whole project. Everyone has different ideas and points of view and this is highly appreciated (see Figure 4). Even if designers are inspired, it doesn’t mean that the project will be proceeding well, because of the structure and goals behind. He expressed the need of having comfortable work environment, which influence much on people’s performance (see figure 5). During the service concept talk some questions appeared: Where is the pain point? Where are the money? How this all is financed? Karri showed a case where the question: “How you are going to get money?” was presented. He described one project where client wanted to get things done without thinking what is happening around and how to get money out of this. Client wasn’t aware that there is a similar service running, actually not so functional and beautiful, free of charge, but not successful. He pointed out that if those kinds of questions could be posted beforehand, maybe some ideas and solutions could make this project successful. Finalizing his talk, Karri showed the picture from the beginning of the presentation. It was a Chinese garden, which is well planned and functional. That was the allegory to the way how all design projects should looks like. Last image was an octopus, which represented many targets, meaning the guesswork, expressing that this would always be a part of design process. The second talk provide by Karri-Pekka Laakso was an interesting view of how to get better solutions from the team. His talk in my opinion was somehow in conflict with the second talk where keeping the team (Divine) inspired was part of the design process. Karri’s thoughts were more about to have clear goals, information, templates and tools to support the team, even when each person’s mood is down people still could be able to find good results.